Nürburgring records are like Motor Trend Car of the Year awards, but with actual value: Everybody participates, and getting the honor is like a giant promotional banner. There’s a Nürburgring record for almost everything, but some—like a record for towing a dang trailer the fastest—still manage to be surprising. 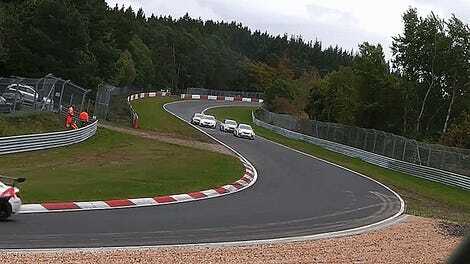 Yes, there is a record for towing a trailer around the Nürburgring. No, we’re not kidding, please stop looking at us like we’re from Mars. That’s Elon Musk, thank you very much. Oh, now you’re googling the record because it’s just “too weird” for you. Thanks for trusting us. We knew you were a real friend. The end of Moetefindt’s video said the Panamera ST did the lap in 12 minutes and six seconds, which is nearly double what the new-but-not-actually-real Porsche 911 GT2 RS did earlier this year. The GT2 RS set the record for fastest street-legal sports car, beating the Lamborghini Huracán Performante. And while watching luxury car companies fiercely battle for sports-car bragging rights is so exciting we could almost yawn, records for towing a trailer are way weirder and cooler to watch. Do more of this, automakers, and film it.